Other than my usual market knitting, working full time and taking care of the girls, I have been making stuff for Rachelle. By the way, for those of you who haven’t heard, we are naming the baby Rachelle. I have knit her 2 skirts and one pair of mittens already. I also have gone through the baby clothes and separated them out. Looking at the 0-3 month clothes, there will be a lot that I can’t use, except if we go camping this summer. 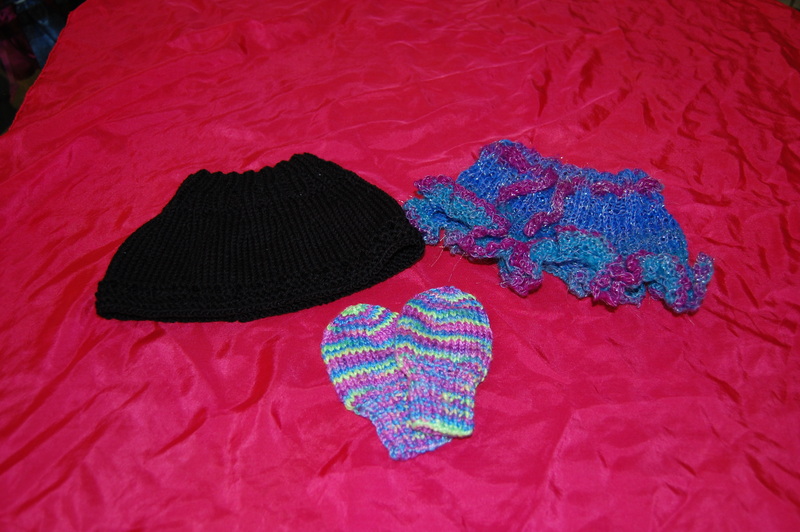 I am hoping that knitting some skirts, getting some shorts and some t-shirt onesies will get us through the summer. Thanks to Kami, her mom and her grandmother jammies won’t be a problem with all the nightgowns they made. I also have some lighter jammies that will work for night time as well. Other than clothes all we will need is a dresser, which I would like to be a changing pad as well so that Sam can’t (?) climb on to it, and a new diaper bag, maybe some more mittens so she won’t scratch herself. All and all, I am not going to have to get too much. Though having a baby event this month at work is not helping, We just got the cutest Butterfly bedding set and I want it, but the one I got for Emma is perfectly fine so I won’t be getting it, but it is killing me to walk past it every day, especially since that whole room is decorated in Butterflies! Oh well. She is a strong little girl so far, but luckily hasn’t kept me up at night like Sam and Emma did, I have hopes that this one might sleep through the night like my sister’s children all do. Sam still has one or 2 nights a week that we have to tell her to go back to bed, but we are getting there, just in time to be sleep deprived again.